After two and a half months in Sicily and nearly eight months on the road, we have sailed south to our first new country for a while, a different culture, and a new continent. I am typing as the sound of the call to prayer echoes in around me in the centre of Tunis. Our feelings on leaving Sicily are mixed. We had become so at home there and were really getting to grips with our Italian and loving the characterful people (and cats). After biding our time at San Vito Lo Capo for a month and spending a week seeing the best of Western Sicily through a newcomer’s eyes (eagerly showing Adrian’s Mum the sights), we were longing to be properly on the road again bound for somewhere new. 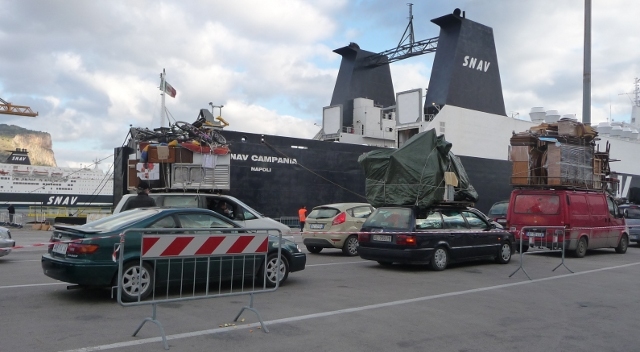 Adrian describes in detail in a separate post the formalities for the traveller sailing from Palermo to Tunis so I won’t repeat those parts of the story. The day we sailed was fine and sunny, but our feelings were of apprehension – the early start, coping with the formalities, the crossing itself, would we find somewhere to stay when we got there with our late in the day arrival in Tunis? (There are few campsites in the north.) Would we like Tunisia? The ship sailed west along the coast that we’ve come to know so well, out of Palermo, along past Mondello and around the headland to Sferracavallo and Isola de Femine. Further past Castellamare del Golfo and Scopello, and the Zingaro Natural Reserve and to San Vito and its lighthouse, followed by Monte Cofano and the hill with Erice in the distance. All these places punctuated by distinctive cliffs and mountains, the afternoon sun picking them out through the haze. Then we struck out beyond the Egadi islands and headed south as darkness fell. The boat was, of course, crowded with families, small children slept in rows on colourful fleece blankets on the floors for much of the day, giving them renewed energy to run around for the last few hours of the trip, while their mothers took their turn to rest on the blankets. Men sat on the open deck with chicha (hubble bubble) pipes. The time went much quicker than we had feared it would though and inspite of the delayed start we arrived in Tunis only slightly behind schedule. We were relieved to get through the port with a minimum of time and trouble and glad to head south a few miles to an outer suburb – Borj Cedria – which our guidebook said had a campsite. The roads were uneven – and we nearly came to blows with the large unmarked speed humps as we followed signs back and forth and did eventually manage to find the place with only a few small detours. The campsite was as basic as described in the book, but we were welcomed and were happy to find somewhere safe to camp, especially arriving late in the evening. We scoffed the remains of our boat picnic, braved the fierce dogs and grim ‘ablution’ block, and hit the sack. Very weary. A slow start the next day – Adrian braved the shower, I managed to brave the loo (a real hover and hope one). Although this campsite would have made quite a good base for exploring Tunis, we decided to head into the city in the van. 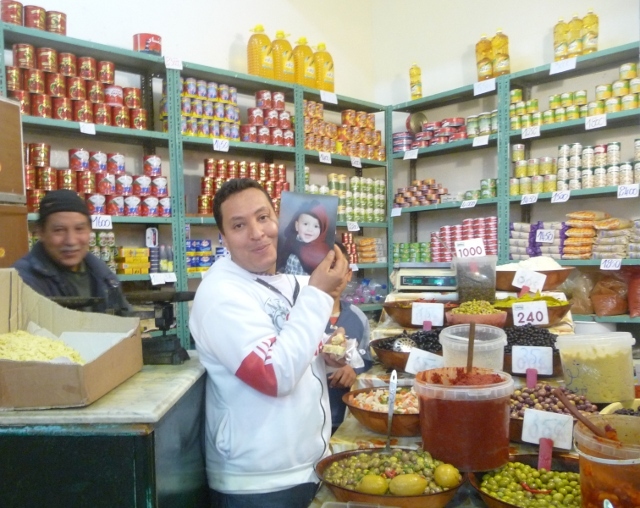 On the way, we called into the nearby town of Hammam Lif and visited its lively Sunday food market. Markets are one of my favourite things to visit in any country. I’m usually reticent about photographing the people there as I don’t want to offend anyone. Stallholders here were very happy and very keen to be in my pictures, although the man at the egg shop refused me. 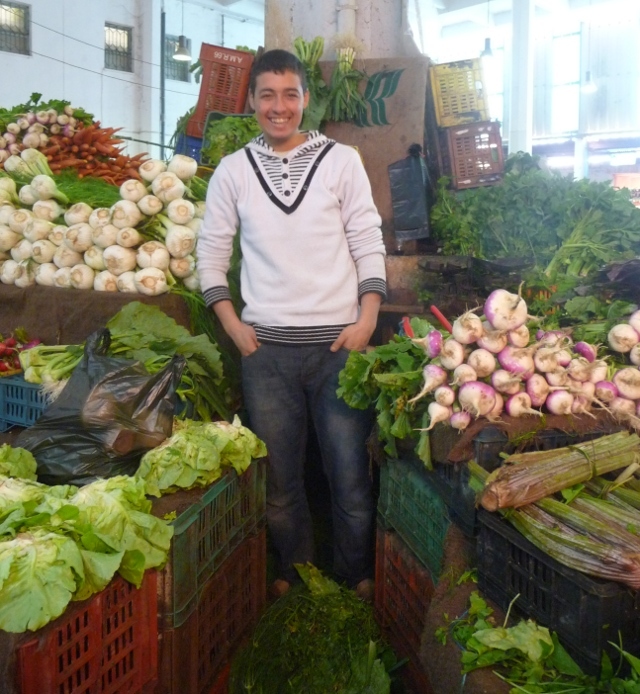 After the delights of a French influenced boulangerie – we headed into Tunis. Stopping for petrol on the way at little more than 50p a litre. We’d spotted a hotel in the guidebook that sounded clean, central and cheap and we actually managed to drive straight there and park along the street without getting even slightly lost. 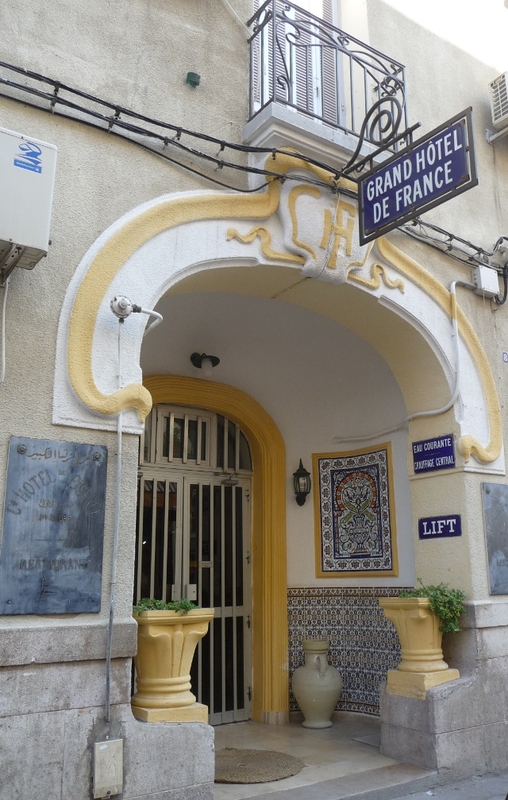 Hôtel de France is attractive and cosy, and good value at a chunk less than £20 a night for the room here in the centre of a capital city. 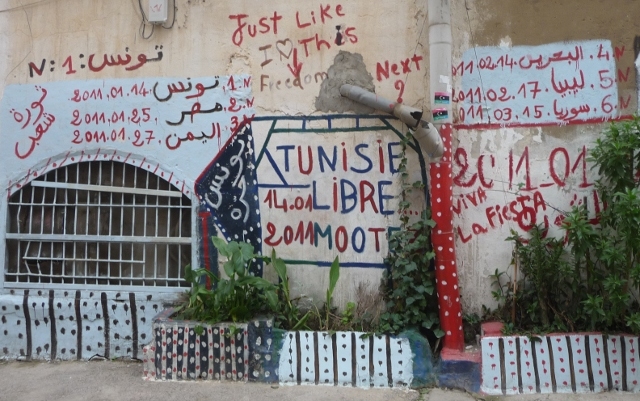 It seems the best option for spending time in and around Tunis as there’s much to see here. We settled in, and found a local parking garage for the van to spend the next few days in. Then headed out to wander around the Medina. Being Sunday, everything was pretty closed up, but in spite of this we still managed to fall for that old trick of being collared to look at a view from a terrace with the pretext of selling us loads of carpets and trinkets. We did manage to get away eventually persuading them that we really did only live in a tiny van with no space whatsoever, not even for jewellery. And even found our way out of the maze of the souk on our own … We then refreshed ourselves with delicious fresh orange juice at a street café on Place Victoire, before strolling along the Avenue Bourguiba – a very European thoroughfare and focal point of the newer city with major hotels, shops and government buildings – very Champs Elysées. We had arrived in Tunisia auspiciously at the end of the first anniversary of the revolution here that ousted a dictatorship and sparked off the Arab spring across the region. Avenue Bourguiba was the focal point of the uprisings and there had been a large demonstration to celebrate yesterday’s anniversary as well as to voice protests over the lack of progress one year on. There is a feeling of tension perhaps because much of the street furniture is augmented by huge rolls of razor wire, armoured vehicles are dotted liberally about, and there are lots of military and police personnel around. The evening saw us venture out on a surprisingly chilly night to visit a local restaurant where we feasted on brik à l’oeuf with crevettes. The local speciality of egg fried in pastry with a twist. Followed by main courses of couscous and merguez sausages and lamb brochettes the bill came in at 16 dinars – around £8. It’s refreshing to be somewhere our money will stretch quite a bit further. Our first impressions are favourable – we’re very excited to be here and look forward to discovering the rest of the city and the country. This entry was posted in By Country - Italy, By Country - Tunisia, Travel stuff. Bookmark the permalink. To avoid eating egg here would almost certainly result in starvation in short order – they are in _everything_. A fine example at lunch today – I had roast chicken. With a poached egg sitting in the hot’n’spicy sauce. Ellie had “Tagine” – which turned out not to be anything like the Moroccan meat stew, but a baked meaty omelette. Very delicious, but very eggy. None of the usual effects, so far, fortunately. And a happy new year to you, too, of course! Still enjoying the trip from my virtual seat in your van Ellie! Looking forward to the Africa leg. Tom the kayaking son paddled the White Nile in Uganda again in 2010 before the dam altered the world’s most challenging river for ever. Now as flat as a pancake apparently but providing much needed HE power. But he loves the country and always comes home feeling inspired and in possession of too much. Hi Lynne – so glad you’re still with us. Tunisia will be our only foray into Africa on this present part of the trip unfortunately. Onward from here overland there’s Libya or Algeria, and although we’d love to go to both, they are still red light foreign office no go areas. Our initial thoughts for this trip included heading east via Turkey, Syria, Lebanon and then back via North Africa if we could. I got the Syria guidebook for last Christmas (2010) and within weeks the country was in turmoil sadly. We hope to do more of Afria in the future though – it is special. Right now we’ve got a thirst to go to more out of the way European countries instead – keep reading!